Lord Voldemort killed Harry Potter’s parents and tried, many times, to slay him. Draco Malfoy only broke Harry’s nose and the two eventually made up. There’s a lesson here for both our politicians and the voters who elect them. Like hundreds of millions around the world, I enjoyed reading the “Harry Potter” series and saw its final film this summer. A conclusion I reached surprised me: compared to “You Know Who,” the rest of the Slytherins weren’t so bad. Sure, there’s a lot to dislike about the behavior of kids in the Hogwarts’ green and silver student house. Draco and his cronies schemed, lied and bullied their schoolmates, especially “Mudbloods,” their slur for magicians with non-magical parents. But their order promotes some positive attributes, like leadership, ambition and resourcefulness. On the other hand, Voldemort and his nefarious Death Eaters unleashed a hateful, destructive and needless war. The Slytherin alumni’s intolerance and lust for power terrorized J.K. Rowlings’ fictional world. Draco’s pranks were simple card tricks compared to their evil sorcery. This revelation didn’t strike me in a movie theater but on Capitol Hill during a recent political conference. All political parties have their faults and I find Republicans’ hostility towards public education, the environment, immigrants and homosexuals unacceptable. Yet the GOP has redeeming qualities, like its commitment to reducing government waste. In contrast, the Tea Party and its congressional caucus sent stock prices spiraling and wreaked economic havoc with inflexible and impossible demands to transform government immediately. Through their obstinacy during the recent debt limit crisis, tea partiers hurt the nation’s credit rating and caused incalculable damage to our economic recovery. The danger of extremism is a central theme of Rowlings’ novels. Americans would do well to read them because both the Potterverse and the debt fight show that zealots who go too far hurt not only the community but also their own interests. One of the Potter saga’s most important events is the decision of Severus Snape, a Slytherin, to abandon and oppose the wickedness of Voldemort’s Death Eaters. In the series’ climactic battle, a score of Slytherins follow suit, helping Harry to finally defeat the Dark Lord’s forces. This saved their world, including the Slytherin House, from tyranny, murder and ruin. While many Republicans admit their fanatic tea party allies make them cringe, the GOP enables and encourages these extremists by refusing to denounce or challenge the likes of Rep. Michelle Bachmann. Republicans should reconsider that practice because most voters dislike those who equate compromise with treason and portray rivals as enemies of the state. 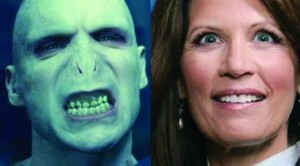 Tea partiers want to destroy President Obama’s administration like Voldemort wanted to kill Harry. Yet the Dark Lord’s attack backfired and made Harry stronger. Could the Tea Party’s reckless tactics actually strengthen the president’s campaign, making Obama the “Chosen One” in 2012? Even those who would like to see this happen would rue the damage tea partiers cause along the way. Republicans should rein them in for the nation’s good and for their own. Will the next Severus Snape raise his wand?